Hi everybody. Here is an excerpt from my show “Adventures of a SuperVet Tech” entitled “Euthanasia”, where I discuss euthanasia from the view of a Registered Veterinary Technician, people who deal with death and dying everyday. I also relate the death of my sister, Linda, to this experience. So many members of the public have come up to me after the show and said, “Thank you so much, I have an old cat and I’ve been so afraid of what’s going to happen. I’m not afraid anymore “. This re-enforces my belief that a euthanasia done well can be beautiful thing. Please share this with anyone who may be helped with facing such a difficult decision. 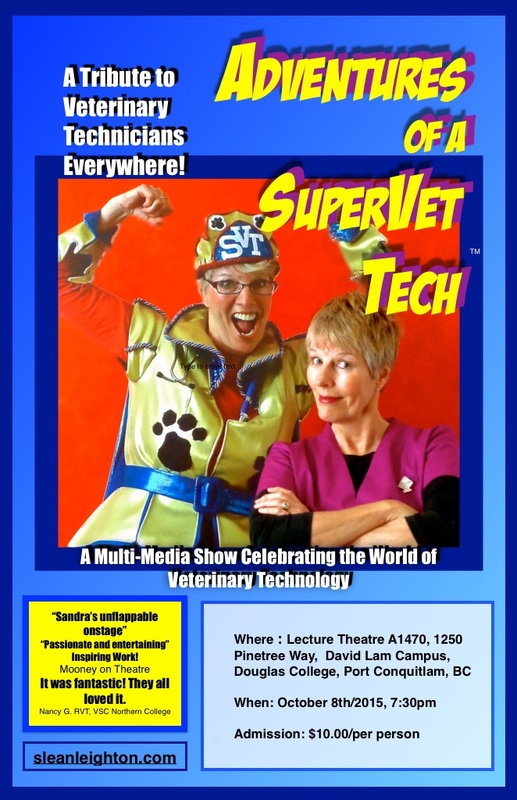 SuperVet Tech is coming to B.C.! Delighted to announce that I will be bringing my show to Douglas College, David Lam Campus, Room A1470, 1250 Pinetree Way, Coquitlam B.C. Oct 8th. 7:30 – 8:30 pm. Open to the public as a fund-raiser for the “Vet Tech Fund”. 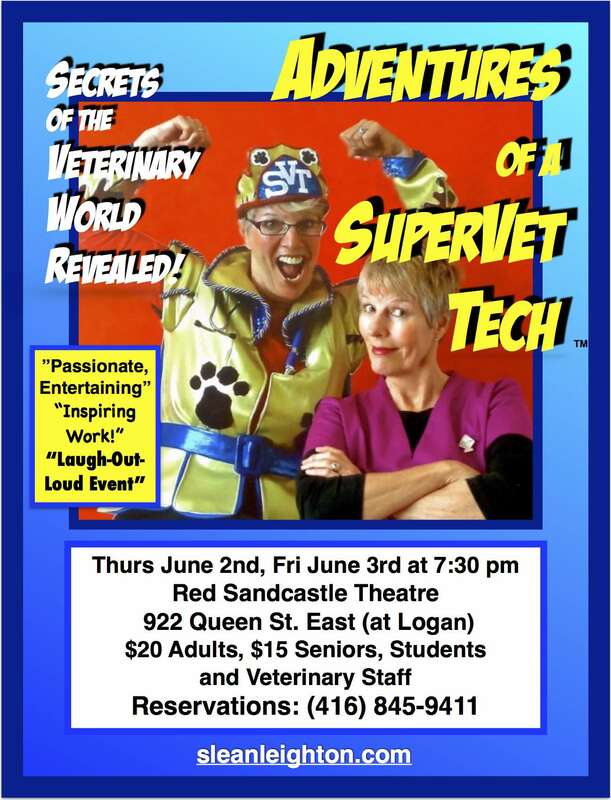 Go to https://www.eventbrite.ca/e/adventures-of-a-supervet-tech-tickets-18641160212 for tickets and more information. See you there! 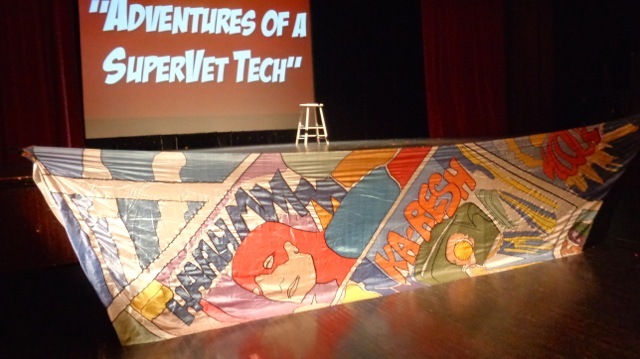 “Adventures of a SuperVet Tech ” is going on tour! (formerly “Behind the Furry Curtain”)! 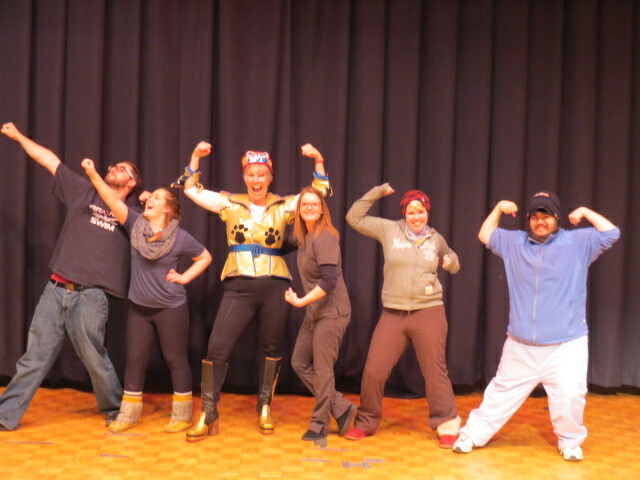 • Starting at $500.00/show, this motivational presentation is designed to instil pride and provide encouragement for students entering the challenging world of the RVT. •Celebrating our achievements and vital role in veterinary medicine. For the first 20 years of my working life, I was an actor, writer and theatrical producer. 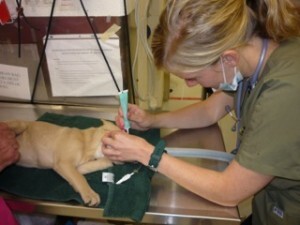 Since 1994, I have had the honor of working as a Registered Veterinary Technician. We vet techs are the unsung heroes of the veterinary world and I aim to raise the public profile of this profession. Our work environment is funny, heart-warming, bizarre and at times tragic. It takes a very special person to withstand the emotional and physical demands of the job. But for those of us who do it, we wouldn’t change it for the world. 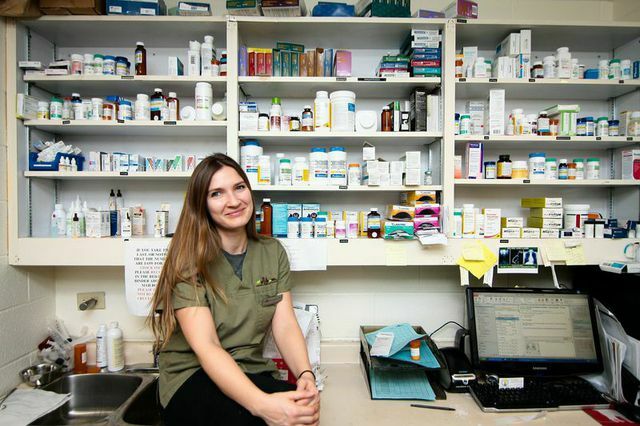 It is to these amazing individuals, my fellow veterinary technicians, that I wish to pay tribute. 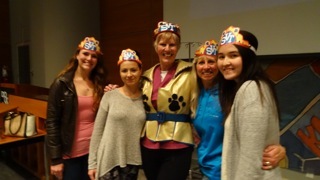 I am thrilled to be taking my show “Adventures of a SuperVet Tech” to veterinary and vet tech colleges, as well as conferences, as a motivational vehicle to veterinary technicians everywhere. 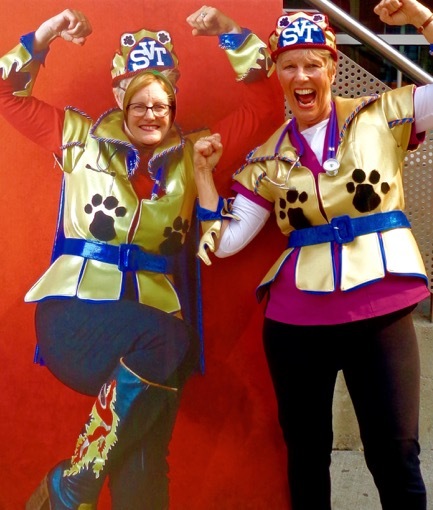 I just wanted to let you know that Sandra came to perform her “Behind the Furry Curtain” show at Northern last week, and it was fantastic! 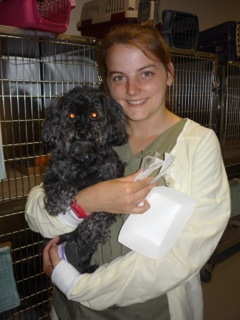 I invited all VT students, Wildlife students, companion animal rehab and VA’s and Groomers, and they all loved it. It also encouraged some VA’s and Groomers to want to continue their education and become VTs. The best part was that it really seemed to raise everyone’s spirits and that was much needed as the winter blues are starting….! Going to the AVTE in Niagara Falls! Delighted to be going with promotional material in hand to the AVTE Symposium in Niagara Falls July 31 – Aug1/15. There, veterinary technician educators from across North America will be gathering for this 3 day event. 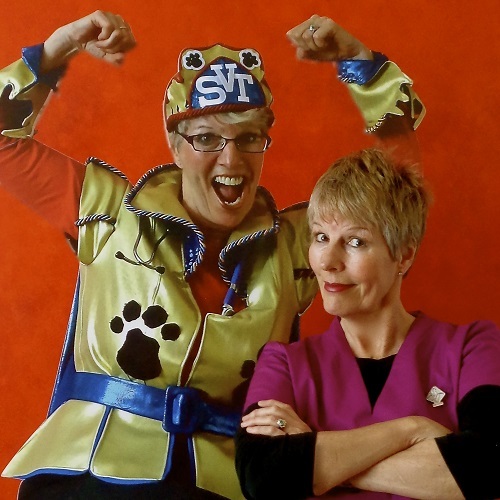 SuperVet Tech will be there to promote her upcoming tours of Ontario and the Pacific Western States.